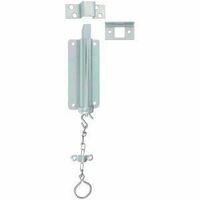 Designed for single or double doors, transom windows and other applications where a chain release is desired. Universal and angle strikes are furnished. Bolt is reversible for in- or out-swinging doors. Chain is 15" long. Steel case, chain and strike. For use on cabinet, double screen, garage and industrial doors. Full 24" long chain.